Pearl Luke’s novel, Burning Ground, won the 2001 Commonwealth Prize for Best First Book, and was also named a Globe and Mail Notable Book of the Year. She wrote her second novel, Madame Zee, based on the true story of Brother, XII, and his mistress, Mabel Rowbotham (Madame Zee), after being inspired by a television documentary about their extraordinary lives. Pearl Luke has an M.A. in English Literature from the University of Calgary and lives on Salt Spring Island, B.C. She is at work on a third novel: Not About Will. Percy Turner watches and waits. Isolated from the outside world and ensconced in the cocoon of her fire tower, she scans the horizon for forest fires. Wrapping herself in this fireproof blanket of routine, Percy insulates herself from the much more dangerous fires that burn within. Even so, she can’t escape the intrusion of disturbing family secrets, her memories of small-town intolerance, and the loss of Marlea, her best friend and sometime lover. As Percy tentatively reaches out for friendship through an email correspondence with a fellow tower operator, she questions her capacity for love—for a man, a woman, and ultimately, herself. 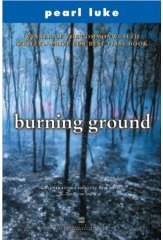 A novel of eroticism and bold, unsentimental lyricism, Burning Ground is a cinematic blend of poignant coming-of-age tale and courageous exploration of desire, sexual identity, and emotional risk. Set in a wilderness landscape, singed with wit and unflinching honesty, it builds to a powerful, unforgettable ending.